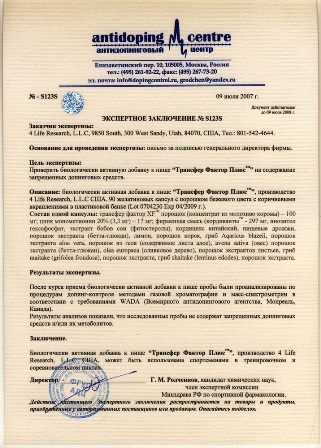 4Life Transfer Factor Approved by the Health Ministry of Russia for use in Hospitals and Clinics! 4Life® Transfer Factor™ Approved By the Health Ministry of Russia for use in Hospitals and Clinics! SANDY, UT (October 1, 2004) - In an unprecedented announcement in the history of network marketing, 4Life announced today that 4Life Transfer Factor products as immune modulators have been approved for use in hospitals and clinics in the Russian Federation. The results of ten separate clinical trials and two experimental studies on 4Life Transfer Factor products were combined in a Methodological Document that was approved by the Ministry of Health, which now allows doctors to recommend 4Life Transfer Factor Classic and 4Life Transfer Factor Plus® products to their patients. Commenting on this remarkable achievement, David Lisonbee, CEO of 4Life stated, “To my knowledge, this is the first time in the history of this industry that a network marketing company or any other dietary supplement company has had one of its dietary supplements approved for use in hospitals in Russia. The Russian Ministry of Health is the equivalent of the Food and Drug Administration in the United States. Doctors and scientists from Russia have been working jointly with scientists from 4Life for several years to arrive at this accomplishment. This approval establishes a new roll of dietary supplements in the Russian health care system. In another sector of research of 4Life Transfer Factor, Dr. Kisielevsky of the Russian Academy of Medical Sciences stated, “The 4Life sample [Transfer Factor Advanced Formula] activated NK (natural killer) cell activity more than the Interleukin-2 (IL2) drug we used as the standard.” This discovery has attracted the attention of The International Scientific and Technical Center (ISTC) of Russia. 4Life Research is the World’s foremost leader in the development, production and distribution of natural immune support products and was recently recognized by Inc. magazine as the fifteenth fastest growing privately-held company in America. Salt Lake City, Utah (January 13, 2011) 4Life® President Steve Tew recently announced that December 2010 was the company’s best sales month in company history. Sales for the month were up 19% from the previous year with annual 2010 worldwide sales up over 20%. Since the company’s launch in 1998, 4Life has established itself as a world leader in direct sales. In 2003, Inc. 500 recognized 4Life as the 15th fastest growing privately-held company in the United States. In 2010 and 2011, Direct Selling News named 4Life among the top 100 Global Direct Selling Companies. 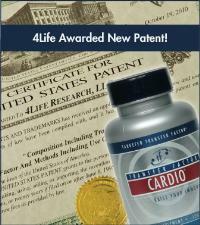 Salt Lake City, Utah (January 3, 2011) 4Life Research™ announced today that the United States Patent & Trademark Office (USPTO) has awarded the company a composition patent that protects the 4Life Transfer Factor® Cardio formula until 2025. This is the company's sixth worldwide patent. 4Life has numerous international patents and dozens of patent applications pending. 4Life's commitment to patents includes an emphasis on research and development to generate formulas, compositions, and processes that are patentable. While 4Life's legal team concentrates on patent acquisition, the International Product Registration department focuses on registrations around the world to support distributor growth now and in the future. In 2010, 4Life completed 101 product registrations in 30 countries. 4Life Founder and CEO David Lisonbee: "Patent protection is just one way that we work to empower 4Life distributors with exclusivity and credibility in the marketplace. 4Life patents provide our distributors with security for decades to come. Salt Lake City, Utah (June 19, 2008) 4Life Research™ announced today that Mark Todd, famed New Zealand equestrian, will publicly endorse 4Life Products. Todd was voted Rider of the 20th century by the International Equestrian Federation. He is a four-time Olympic medalist, including two gold medals. He primarily competes in eventing, which includes dressage, cross-country, and show jumping. In 1984 and 1988, he was the first rider to win successive individual three-day-event Olympic gold medals in 60 years. 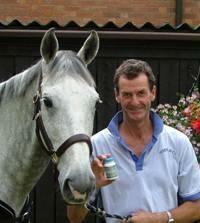 He won the prestigious Badminton Horse Trials on three occasions and the Burghley three-day trials five times. He retired from eventing following the 2000 Sydney Olympics, but decided to make a return for the 2008 Beijing Olympics. In May 2008 he qualified for the 2008 Olympics at the three-day event in Samur, France. 4Life, the leader in the development, production, and distribution of Transfer Factor support products, continues to post growth in more than 40 countries around the world. Salt Lake City, Utah (December 4, 2007) As first reported by 4Life Chief Scientific Officer Calvin McCausland, Ph.D., in Direct Selling News, 4Life received documentation from the Federal Anti-Doping Center in Moscow, Russia, that admits 4Life Transfer Factor for use by Olympians in practice, training, and competition. Approval was obtained after volunteers consumed 4Life Transfer Factor products and their bodily fluids were analyzed in accordance with doping control procedures that employ modern methods of gas chromatography and mass-spectrometry in compliance with the World Anti-Doping Agency in Montreal, Canada. 4Life Founder and Chief Executive Officer David Lisonbee launched 4Life Research in 1998 with a commitment to the highest scientific standards. Ongoing research and development of Transfer Factor technology has fueled 4Life’s constant growth and maximized every distributor’s ability to grow a successful independent business. “Arguably, this kind of marketplace positioning and high level product messaging simply isn’t possible without the involvement of a professional research and development team,” added McCausland. September 21, 2007 (Salt Lake City, Utah) 4Life Research™, the world leader in Transfer Factor science and immune system support development, announced today the discovery of immune activity in a weight range of molecules significantly smaller than transfer factors. Transfer factors are molecules in a weight class between 3,500 - 12,000 daltons that help the immune system recognize, respond to, and remember outside threats. Although scientists have known that smaller molecules than transfer factors existed within cow colostrum, their significance in terms of immune activity has been unknown until now. In 2005, 4Life Chief Executive Officer David Lisonbee and the Research and Development department began studying these low weight molecules. After two years of research, 4Life clinical findings now indicate that molecules in a weight range between 250 — 3,000 daltons play important regulatory roles in the immune system. 4Life extracted and concentrated these nanofraction molecules from cow colostrum for their proprietary NanoFactor™ extract, combining NanoFactor with their exclusive Transfer Factor E-XF™ extract of transfer factors from cow colostrum and chicken egg yolks to produce 4Life Transfer Factor® Tri-Factor™ Formula, the most comprehensive approach to immune system support available today. "I don't know of another company in our category," said 4Life Chief Scientific Officer Calvin McCausland, Ph.D. "In 2004, we were the first company to combine transfer factors from cow colostrum and chicken egg yolks. In 2005, we introduced RioVida®, the world's only transfer factor beverage. Now, the discovery of new immune activity in nanofractions. 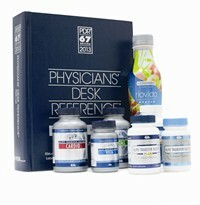 When it comes to scientific innovation, there's simply no comparison to 4Life." 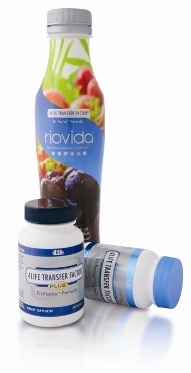 4Life Transfer Factor, Transfer Factor Plus®, and RioVida are now fortified with the new Tri-Factor Formula. "We're taking Tri-Factor Formula to the world because no other product represents such a unique and indispensable opportunity for a quality life," remarked 4Life President Steve Tew. David Lisonbee: "At the end of the day, our distributors can rest assured that 4Life will stay a good pace ahead of the curve in the areas of science, service, and success." 4Life, global leader in the development, production, and distribution of Transfer Factor immune support products, continues to post growth in more than 40 countries around the world.